It’s currently the Green turtle nesting season on Denis Private Island, and we have been lucky enough to sight a swarm of baby turtles dashing off to the sea for their first swim just last week. Denis Island's Green turtles nest in the period between May and September, so we are now in the middle of the season. The island conservation team walks the entire 6km-long beach every morning to look for tracks of females that have come up to nest during the night. It takes two months for a nest to hatch, and the team place a marker (a coconut on a pole providing the date of laying and the expected hatching date) at each turtle nest. 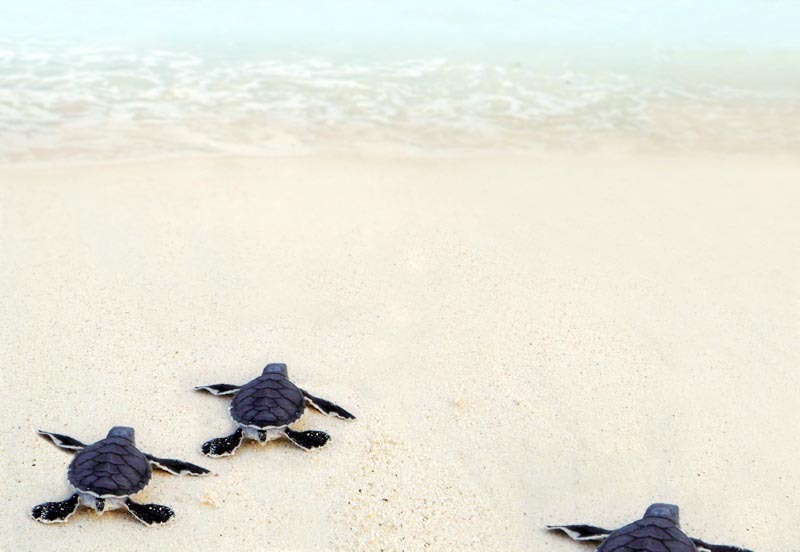 This way everybody, including the guests, can keep an eye out for little turtles coming out! You have to be lucky to spot them, as a nest usually comes out between sunset and sunrise, and it takes only a few minutes for the little babies to emerge out of the nest and to reach the sea. On this particular morning our conservation manager found one nest hatching while she was doing her daily survey. At around 9.15 am, our guests were happily surprised during their breakfast with the special invite to come watch the cute newborns! Guests who were still in their cottages got a phone call to come watch the spectacle. The children were thrilled to have the chance to see the ca. 6-cm white-edged hatchlings from close and to hold them, and everyone took part in releasing them on the beach. For most guests it was the first time that they had seen baby turtles! It is amazing to be able to watch the wonders of nature, those that you normally only see on TV, happening right in front of you! If you wish to know more about our turtles, please read our Turtle Fact Sheet and visit us in Turtle Nesting season.